Widely revered as one of Ireland’s finest interpreters of song, Seán Tyrrell is in the Town Hall Theatre studio next week with Message of Peace, his celebration of Irish hero John Boyle O’Reilly (1844-1890 ). 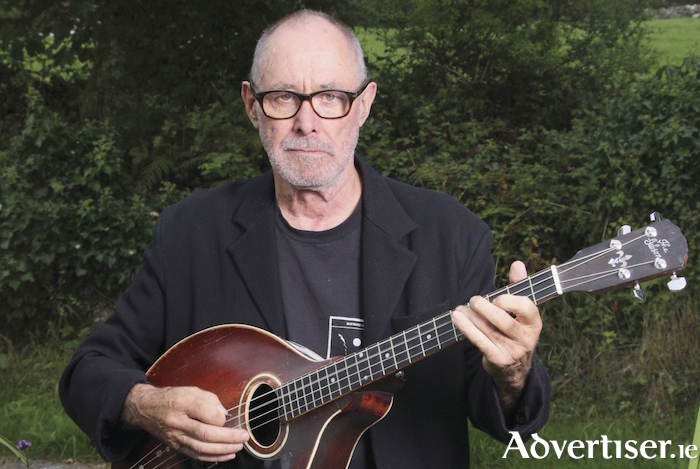 Blending song and spoken word, Tyrrell traces O’Reilly’s life, covering his Famine-era childhood, his membership of the IRB, his transportation to Australia, and his daring escape to the United States. In America, O’Reilly edited The Pilot newspaper, championed Native and African American rights, and spoke out against anti-Semitism. A visionary and poet, his commitment to justice inspired generations of civil rights activists. Seán Tyrrell has long been fascinated by O’Reilly and, over an afternoon coffee, he discussed this abiding passion and reflected on his six decades of music-making. “Neither of my parents played music but my dad was a good singer and they were both great set dancers, so there was music at every Tyrrell family gathering,” Seán begins. “I was also fascinated by the Blind Dunnes, brothers Christy and Joseph, who used to busk here during the Galway races. It was from them I got interested in the banjo. As well as putting music to poems from earlier eras, Tyrrell did arrangements for two poems by Michael Hartnett. “A friend sent me ‘Belladonna in the Bar’ and I set it to music then wrote to Michael who gave me permission to sing it," he says. "A while later I heard Mary O’Malley read his poem ‘The Ghost of Billy Mulvihill’; I got the text off her there and then, drove straight home and out popped a tune for it. It’s on my album The Orchard and when I was launching that in Dublin, Pat Collins was doing his Michael Hartnett film, A Necklace of Wrens, and he asked me to contribute to it.